WE ARE ON TV CHANNEL "MIR" IN A PROGRAM "MADE IN USSR"
Soviet Jewelry is a global development organization for the Soviet gold and silver jewelry market. Get the latest Soviet Gold & Silver Jewelry News. Receive discounts, upcoming product alerts and much more. Definition: Soviet Jewelry - Gold and Silver Jewelry produced in The Union of Soviet Socialist Republics [USSR] from 1922 to 1991. 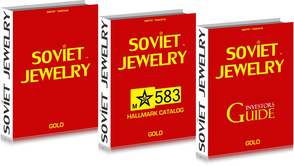 If you are seriously interested in purchasing Soviet Gold and Silver Jewelry as a collectible or an investment then our best selling three-book series is a must-have for you. No one knows this market better then us, after all we launched it! 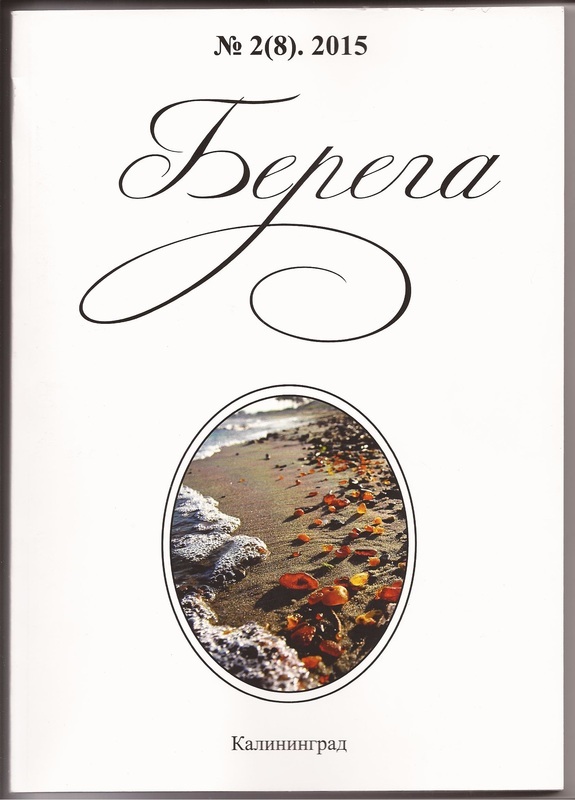 So whether you are a novice art investor or a seasoned jewelry collector our books will have volumes of new and highly valuable information for you! CLICK HERE to identify Soviet Gold and Silver Jewelry Hallmarks and receive your Hallmark Identification Certificate within 48 hours! CLICK HERE to learn more about our authentication services. 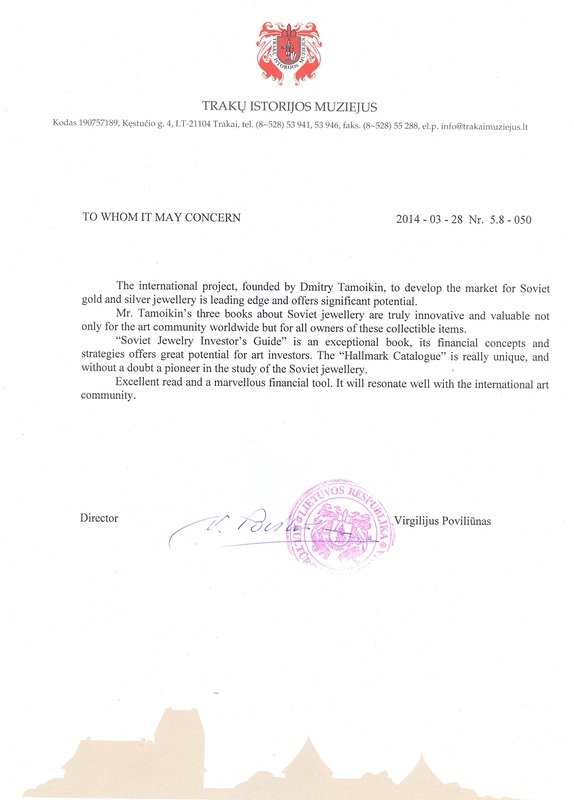 We are the first to issue Certificates Of Authenticity for Soviet Gold & Silver Jewelry. CLICK HERE to buy certified Soviet Gold & Silver Jewelry. Each item will come with our Certificate Of Authenticity, Hallmark ID Certificate and much more! In 2016 record amounts of Soviet Gold Collectibles were bought and sold - while prices exceeded all expectations. 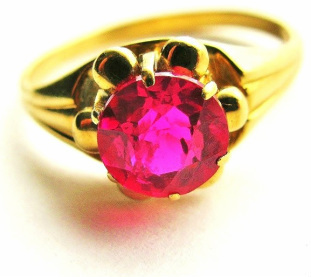 This market received worldwide media coverage as Soviet Gold Jewellery rose to became one of the most profitable alternative investments in the World. Collectors and investors from United States, Europe, Russia, China and many other nations spent millions on these rare art assets. Soviet Jewelry Market showed that it can, not only withstand, but prosper in hard economic times. 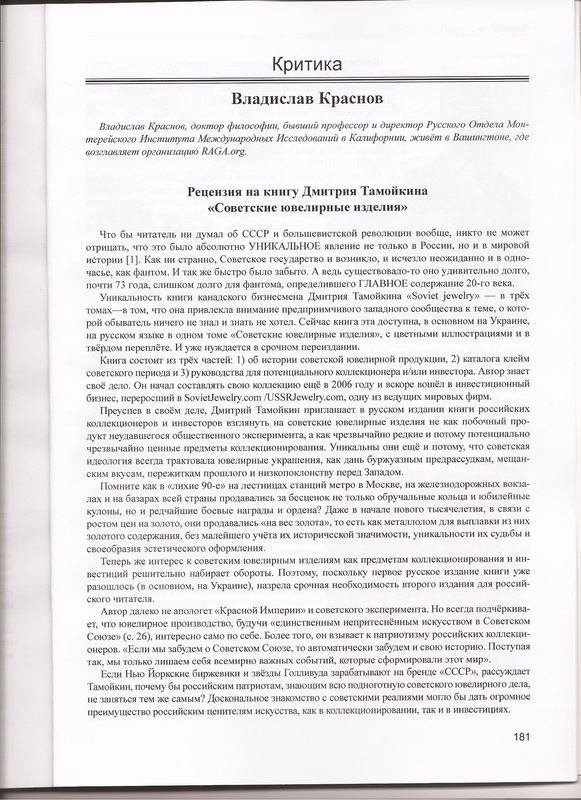 Currency devaluations, geopolitical conformations, financial downturns and even economic collapses – substantially increased the value of Soviet Gold by motivating thousands of people to purchase these unique items in order to protect their wealth. Still growing at nearly 200% per year Soviet Gold Jewelry isn't just rare collectibles, they are a fantastic investment of your money. In 2017 these unique assets are still accessible to the public, however their abundance is decreasing rapidly. As the supply drops, the demand and value of Soviet Gold will rise exponentially. This trend has already began to happen, however the full-scale market boom is still to come. Last year Soviet Silver Collectibles didn’t just become one of the most profitable assets to buy on the entire art market – they outperformed Soviet Gold! That’s right, Soviet Silver Jewelry experienced unprecedented value expansion - market wide, with some items growing more than 400%. This year we expect a continuation of this trend, with ever more stunning sales at record breaking prices. Just as Soviet Gold - Soviet Silver withstood all economic and geopolitical turmoil, growing substantially in value all across the Globe, from United States to Russia and everywhere in between. 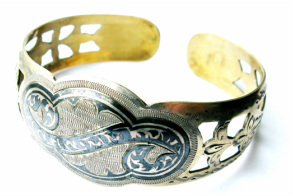 Although many items on this market have crossed a thousand dollar threshold, a great deal of Soviet Silver Jewellery is still relatively accessible. We encourage investors and collectors to take advantage of this unique opportunity, since prices will only rise on this hot new art market. 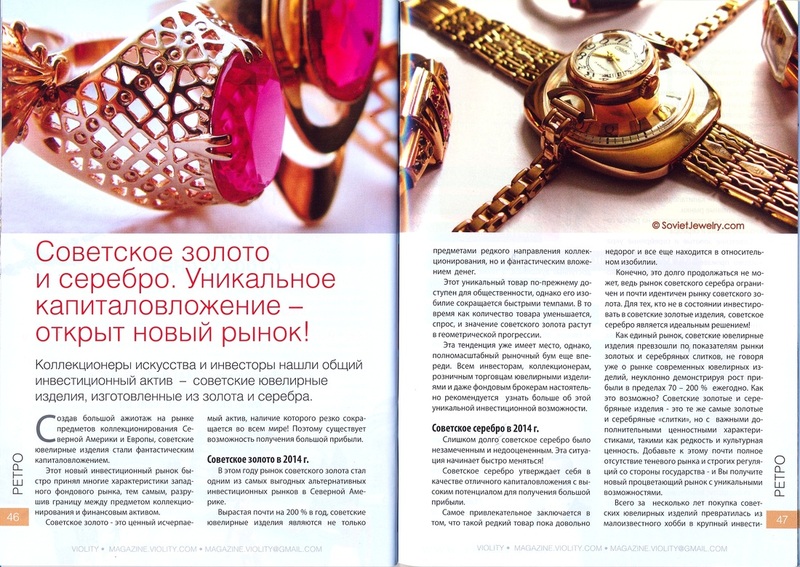 When it comes to Soviet Gold and Silver Jewelry we are the leading news source in the world! 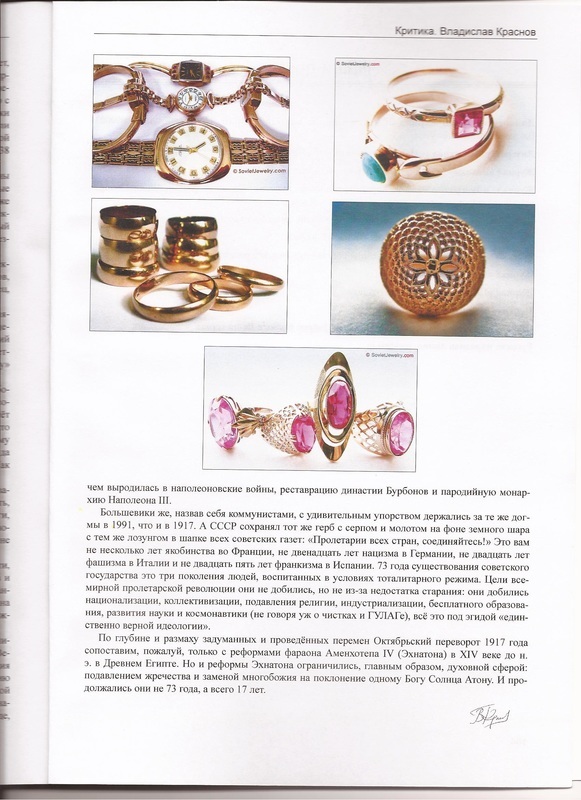 After all, we are the very first news site on the web dedicated solely to the Soviet Jewelry market. There's simply no one like us. Our unique team of reporters and experts constantly monitors the Soviet Gold and Silver market to deliver you the latest news, trends, alerts, stories and much more! Above that, we closely watch jewelry, art, precious metals and finance markets to identify important developments that may impact Soviet Gold and Silver Jewelry. 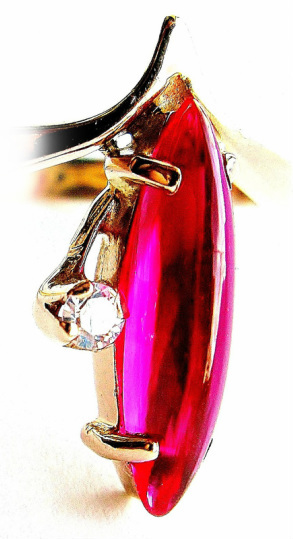 Stay ahead of the game - READ SOVIET JEWELRY NEWS! Each book from the Soviet Jewelry Series is packed with colorful illustrations and high-definition images. We also made them affordable so that everyone can get the best knowledge for the best price. Although we recommend it, you don't have to purchase all three books at once. 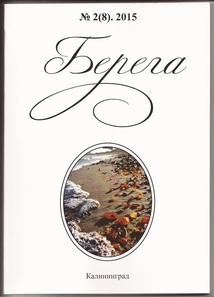 Each book is a stand-alone product. 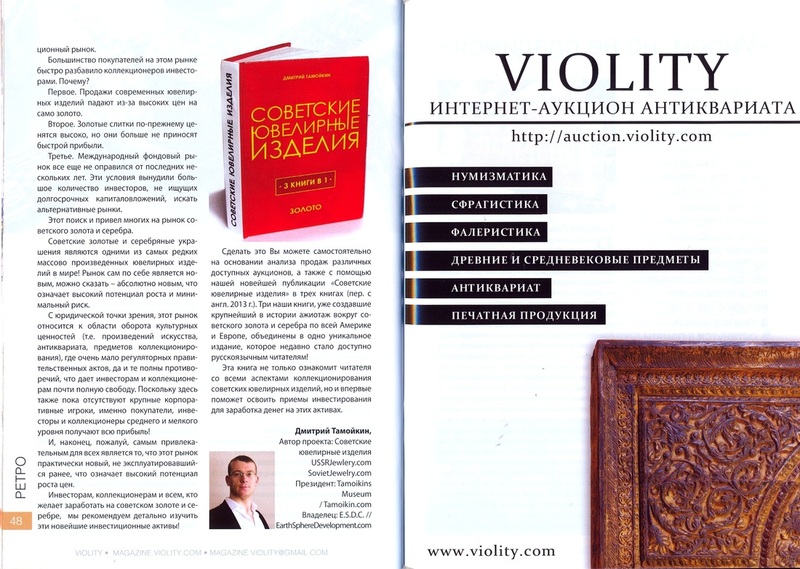 For example collectors prefer the "Hallmark Catalog", investors the "Investor's Guide" while owners like our original book the "Soviet Jewelry". We also have combo packages available. Whatever you choose, we know our books will service you well! 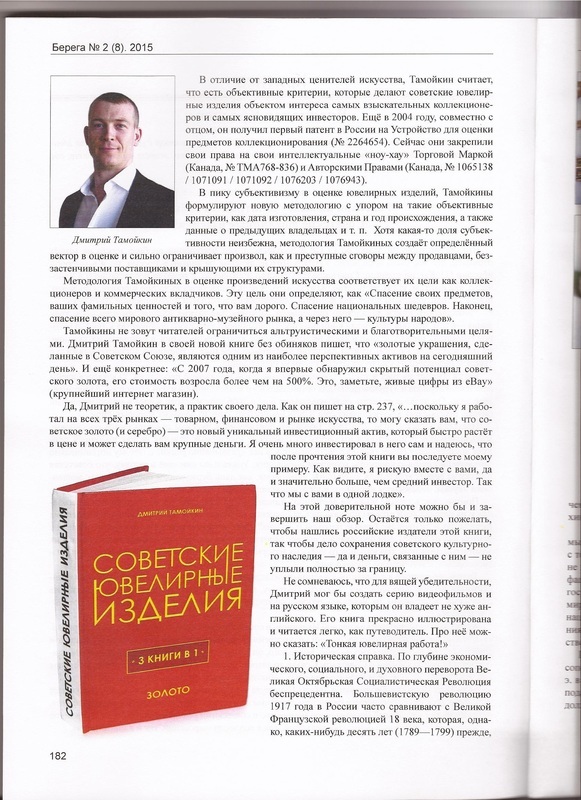 The Soviet Gold Market is the newest and most lucrative alternative investment market out there. The Soviet Silver Market is not far behind! Together they form the Global Soviet Jewelry Market which is becoming one of the most profitable art markets in the world! Our books will help you master it in no time. Start today! BUY SOVIET GOLD / SILVER buttons will take you to Soviet Gold or Silver Jewelry listed for sale on eBay. This is a non-profit service, we are not associated with eBay sellers. *Market Data 2017, Prognosis 2016-2017 and Price Averages are based on our continuous analysis of the North American and International Soviet Gold Jewelry Markets as well as the best judgment of our experts. We cannot guaranty these values. They are for your informational purposes only. Due to constant market fluctuations all values are subject to change. Visit us often to get the latest data! "We will tailor each purchase to your budget, goals, and desires! Big Governments & their Regulations! Stock brokers and art collectors have found an investment they can agree on, an unusual hybrid product called Soviet Gold Jewelry. Born in an art market environment, it quickly adopted stock market trading techniques and breached the gap between a collectible and a commodity. Supply is limited and demand is high. 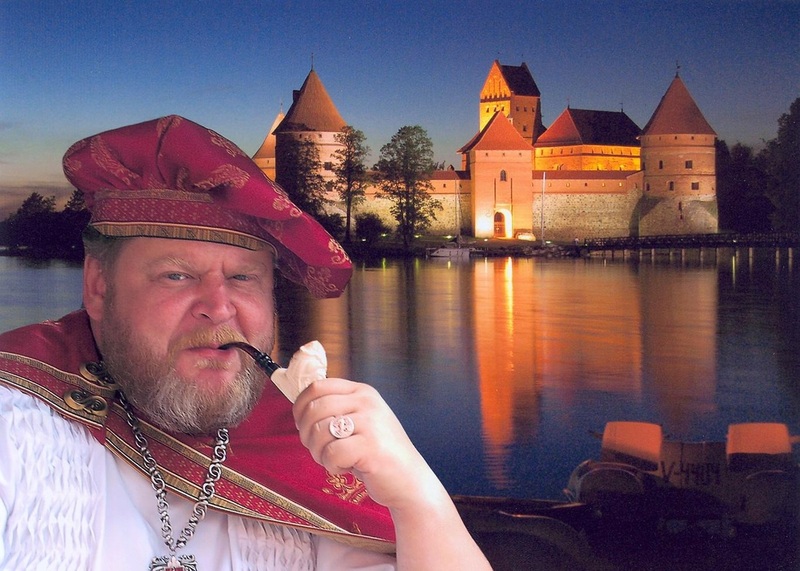 The number of Soviet Gold investors and collectors is skyrocketing in the United States [largest buyer], Canada, Europe, and Asia. This market is becoming very hot. All trends indicate that this commodity is a lucrative investment with strong public demand. The Soviet Gold Market has surpassed both the Gold Bullion and Gold Jewelry Markets, steadily growing between 70% and 200% annually. How is that possible? Soviet Gold Jewelry is that same gold bullion but with a number of additional value-making characteristics such as rarity and cultural value. Add to that the complete absence of stringent government regulations and murky corporate lobbying, and you get a booming new market. 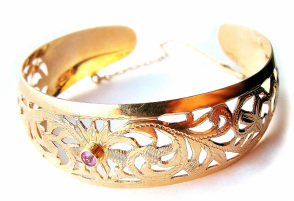 Sales of modern gold jewelry are falling due to the high price of gold. Gold itself although highly valued has evened out, no longer yielding quick profits. The stock market is still recovering from the past few years. These conditions have forced many small investors, who are not in it for the long run, to look outside the box for new opportunities. This search has led many to the Soviet Gold Market. Soviet Gold Jewelry is the rarest mass produced gold in the world, making more money for buyers than any other gold investment. Since 2009 it has quadrupled in value, with minimum price growth over 70% per year. The market itself is brand new, one would say virgin, which means large growth potential and low risk. Legally the market is classified under the category of cultural property [art, antiques, and collectibles] where there are virtually no government regulations, giving investors and collectors complete freedom. Because there are no big corporate players in the game, the "little guy" is left alone to keep all the profit. Finally, perhaps the most attractive point to all investors is the fact that this market is unexploited and full of growth potential. So, this most unlikely product, Soviet Gold Jewelry, is prospering in the most unlikely place, the United States of America. Investors, collectors, and everyone who desires to make an extra dollar in this economy are advised to look into this new opportunity. We are the first to develop and the only company in the World to offer Hallmark Identification Certificates for Soviet Gold and Silver Jewelry. We will identify your Soviet Gold and Silver Jewelry Hallmarks and send you an individually numbered Hallmark Identification Certificate [via email]. A copy of the issued certificate will be stored in our offline database for authenticity and verification purposes. Each request will be treated on an individual basis. Buying Soviet Gold or Silver? Selling Soviet Gold or Silver? We are the first to develop and the only company in the World to offer Certificates Of Authenticity for Soviet Gold and Silver Jewelry. Prices on Soviet Gold and Silver are growing very fast. These unique items are becoming very valuable. Although for now this market is 99% authentic it will not always be this way. Protect yourself in advance by acquiring Certificates Of Authenticity for your Soviet Gold and Silver. 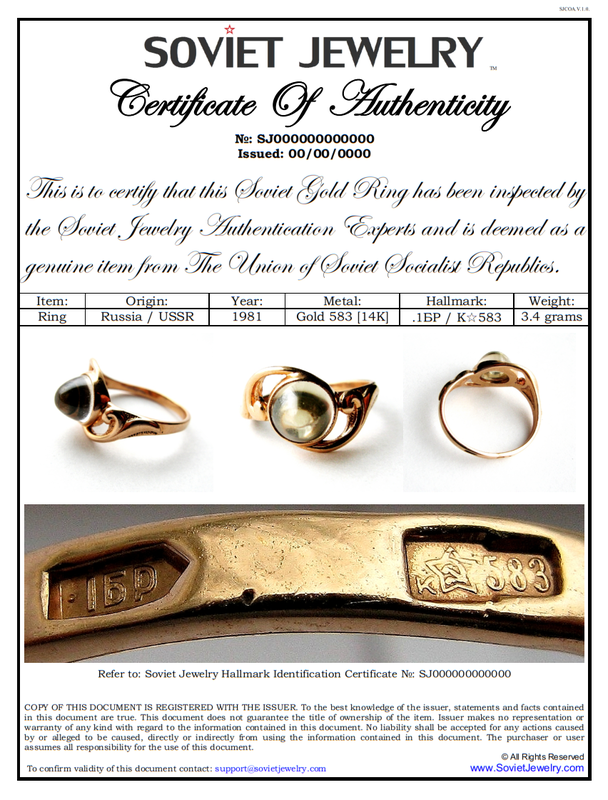 Our experts will authenticate your Soviet Gold and Silver Jewelry and issue you an individually numbered Certificate Of Authenticity. A copy of the issued certificate will be stored in our offline database for verification purposes. Each request will be treated on an individual basis. Sellers: By showing our Certificate Of Authenticity you give buyers full assurance that your Soviet Gold and Silver Jewelry is 100% authentic. Buyers: Protect your purchase by requesting our Certificates Of Authenticity from Soviet Gold and Silver Jewelry sellers. First Consultation is FREE - Schedule Today! You can relax knowing that all your books are protected by a 30 day unconditional money back guarantee. We are very proud of our books and we stand behind them 100%. If you're not completely satisfied, just let us know and we will send you a refund right away. NOTE: All Services we provide are Not Refundable.